Horse racing is full of gamblers, from the bettors who play the races on the front side to the owners taking a chance on young bloodstock at the sales. Such was the case with Aron Wellman at the Fasig-Tipton Saratoga Select Sale when he came across a yearling son of Tapit. Wellman gathered his Eclipse Thoroughbred Partnership and hooked up with Bridlewood Farm and Robert LaPenta to secure the colt for $1.2 million, and nearly two years later Tapwrit rewarded Wellman's faith with a two-length score in the Grade 1 Belmont Stakes. Jockey Jose Ortiz earned his first Triple Crown victory aboard Tapwrit, guiding him from a stalking position in fourth to challenge Irish War Cry at the head of the lane. The Pletcher trainee carried wide and then dove back toward his rival, but had enough left to pull away by two lengths as he crossed under the wire in front to earn a third Belmont win for his trainer. Tapwrit covered 1 1/2 miles over the fast main track at Belmont Park in 2:30.02 to give his sire the winner of three of the last four runnings of the third jewel of the Triple Crown. Both Irish War Cry and Tapwrit had a very good beginning, pulling for the lead as the field stretched toward the clubhouse turn. Meantime, extremely restless during the warm-up, shot up to accompany Irish War Cry at the front of the pack as Ortiz reined Tapwrit back to third to settle just off the pace. Gormley came up to keep stride with Tapwrit off the pace as Irish War Cry and Meantime made the first quarter in 23.88 seconds. Entering the clubhouse turn a scary incident at the back of the field, in which Hollywood Handsome had to be pulled off the heels of the horses in front of him, caused jockey Florent Geroux to lose his stirrups aboard the Dallas Stewart trainee. Out of control, the pair surged around the outside of the pack, moving all the way up to third position at the top of the backstretch before Geroux was able to angle the colt to the outside of the track, pulling him up to where he could be assisted by an outrider. AAEP On-call vet Keith Latson said after the race that Hollywood Handsome had a laceration behind the left knee, and that Stewart requested a van ride back to the barn. The laceration goes through the skin, can be cleaned up and closed, and appears to be a very minor injury. Irish War Cry eased up a bit to set a half-mile fraction of :48.66, a split of 24.78 seconds as he took the lead from Meantime. Tapwrit and Gormley were on nearly even terms in third and fourth, and the one-eyed Patch was well up near the pace in fifth position. Gormley moved in front of Tapwrit to take third as Irish War Cry was able to get away from his rivals by nearly two lengths in the far turn. Meantime began to drop out of the race, giving Ortiz room to move Tapwrit up to the outside of Irish War Cry, just a length off the leader turning for home. Gormley and Patch continued to do battle for third, but the two frontrunners quickly moved away from the rest of the field. Irish War Cry's lead decreased inch by inch as Tapwrit, game to the end, dropped his head and went to work. Though he wandered about a bit, first toward the center of the track, then when Ortiz swung him toward Irish War Cry so he could see his rival in the final sixteenth of a mile, Tapwrit hit the gas to pull away convincingly in the final 75 yards. Irish War Cry ran a very good race in second, and it was another 5 3/4 lengths back to Patch in third to give Pletcher the first and third-place finishers. Gormley held on to be fourth over Senior Investment. Bred in Kentucky by My Meadowview, Tapwrit made an appealing yearling by the leading sire and out of the Grade 1-winning mare Appealing Zophi (Successful Appeal). Though the colt disappointed on debut, finishing 10th in a maiden special weight at Saratoga, he made up for it with a win next out at Gulfstream Park West. From there, Tapwrit won Gulfstream's listed Pulpit Stakes, then finished second to McCraken in the G3 Sam F. Davis Stakes at Tampa. He won the Tampa Bay Derby en route to a terrible trip in the Blue Grass Stakes, where he finished fifth, and again found trouble in the Kentucky Derby to come running late and finish sixth. 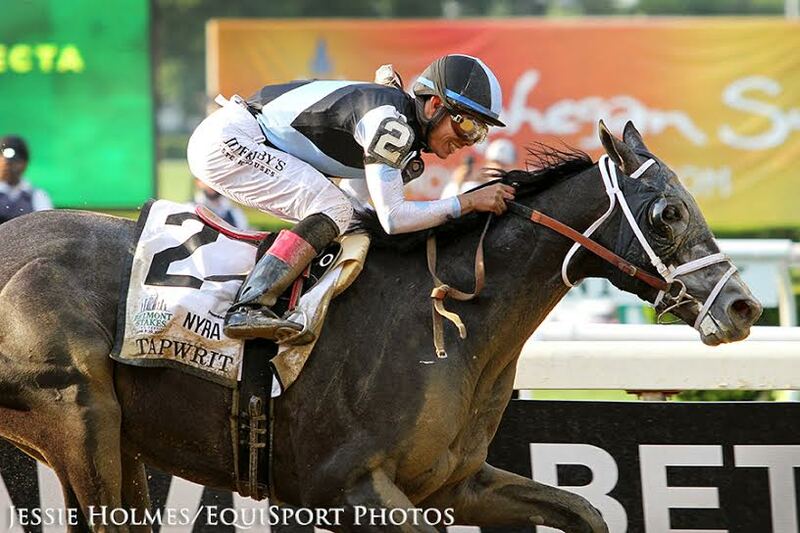 Overall, Tapwrit has won four of his eight starts for earnings of over $1.1 million. He is the ninth horse in the last eighteen years to run in the Derby, skip the Preakness and then win the Belmont Stakes. This entry was posted in NL Article, Triple Crown, Videos and tagged Aron Wellman, belmont, belmont park, belmont stakes, Bridlewood Farm, Eclipse Thoroughbred Partners, irish war cry, jose ortiz, Robert LaPenta, tapit, tapwrit, todd pletcher, Triple Crown by Paulick Report Staff. Bookmark the permalink.